Money, money, and more money. Forever continuing to shape and expand college sports. There is a new agreement in place and working on being finalized, involving the Big 12 or Pac 12 and the Big East, Conference USA, MAC, Sun Belt and the Mountain West. The unnamed Bowl game without a final location (Houston is the leading candidate) will be worth about $20 Million and will either pit a Big 12 or Pac 12 team, against the highest rated team from one of those five other conferences. Basically the highest rated team from those five other conferences is winning the lucky prize of being taken to the woodshed by a Big 12 or Pac 12 team. At least they will be making money for their conference. This move is a long-time coming though; with the new system, they couldn’t keep all of the money in the big five conferences and expect the other college football teams to survive. I have no problem with this new bowl game being added; with the amount of money being generated by college football, these other conferences at least deserve a sniff of the pot. I hope they come up with an awesome name for this bowl game; perhaps the Pity Bowl or the Woodshed Bowl. According to CBS Sports, “The addition of a seventh bowl establishes a clear pecking order among the contract bowls going into the playoff in 2014. 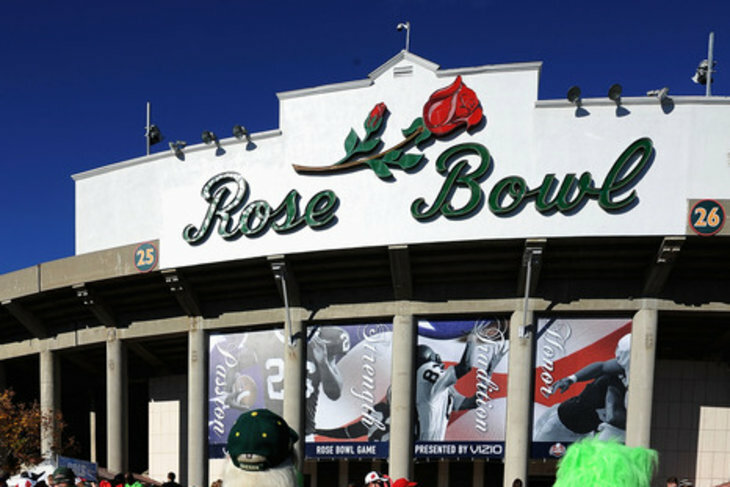 The Rose Bowl changed the landscape when it signed an unprecedented deal worth $80 million in each of the next 12 years with ESPN. The pending Champions Bowl deal (SEC-Big 12) is expected to be for the same amount. The Orange Bowl (ACC champ vs. Notre Dame/SEC/Big Ten) will be worth somewhere between $20 million-$60 million. Another “access” bowl will be the Sugar Bowl, and I’m not sure what the other will be to be perfectly honest. Perhaps the Cotton Bowl will get the nod with Jerry World as the home. All I know is that I’m going to be happy once everything is finalized and the speculation can stop and people can just see what exactly all the rules and specifications will be. 2014 is a long way off, so unfortunately this stuff won’t be finalized for a while. Lee Corso is still on Gameday purely for entertainment value…he doesn’t even contribute anything anymore. This entry was posted in College Football and tagged 7th Bowl Game, BCS, Big 12, Big East, Big Ten, CBS Sports, Champions Bowl, Conference USA, Cotton Bowl, Fiesta Bowl, MAC, Mountain West, Orange Bowl, Pac 12, Playoff, Rose Bowl, SEC, Sugar Bowl, Sun Belt. Bookmark the permalink.